Discussion in 'General Discussion archive 2018 (read-only)' started by Famous when dead, Mar 10, 2018. "Morrissey has a bad night out on this epic Smiths song, which saw Johnny Marr’s guitar virtuosity take centre stage. Since its release in the summer of 1984, the song has become a rallying cry for the lonely and awkward, its depiction of a social misfit at odds with the trendies and cool kids becoming an iconic moment in its own right. 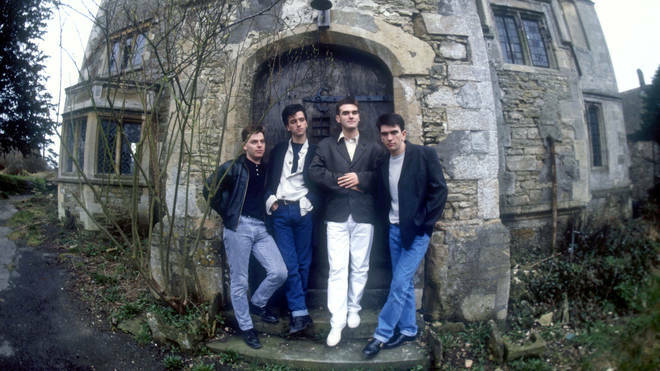 But for what was to become one of the most famous Smiths songs of all - and quite possibly a contender for the band’s very best recording - the track had something of an inauspicious beginning." An article with video links to all the material that inspired the creation of the song. Great article. Thanks for sharing it FWD. HSIN is my absolutely favourite The Smiths song. It has the perfect equation between astounding music and mobilizing lyrics. It's at the same time a cry for tolerance and a reflection on the anguish of loneliness, which makes it the hymn of an era that has not ended. What can I say? This song touched my soul. Everyone knows the best smiths song is CEMETRY GATES (Which is also the entrance to the place where they bury the recent Moz albums!) Just like everyone knows the best Morrissey song Is Southpaw of his best album SOUTHPAW GRAMMAR! My favourite Morrissey track is Mountjoy. Also, Home is a Question Mark. Plus all the rest! His best album is World Peace Is None Of Your Business. Best Smiths track, Heaven Knows I'm Miserable Now. It's OK, but let's face it - it's no 'Golden Lights'. I don't think it's their best song, but I do think the "William" 12" b/w "How Soon is Now" and "Please Please Please" was the best single "package" of their career. I'd say the same for "Boxers" b/w "Have a Go" and "Whatever Happens" for his solo career. Just complete worlds of their own. Not mine, it's too long, and Johnny's riff which goes on through the whole song, if you heard it a lot, it gets on my nerves, but the 'there's a club if you want go,etc. ' never bores you, same as 'November' not Smiths but mainly the same,but the last minute is wonderfull. Johnny's riff never bores me but Jesse's grates a bit. In the context of November Spawned A Monster while Jesse does play it live it's Kevin Armstrong's riff. "how soon is now" was definitely the highlight of the latest tour. i cried at royal albert hall. According to the asian Well Hung Son. I'm afraid I was with Geoff Travis on this one....turned over "William" and thought "what the Hell is this?" Wasn't too impressed with "Please Please Please" either, seemed like half a song, almost as if that's all there was space for after HSIN. So they were the first two songs in the Smiths cannon I didn't actually like. Wish he'd leave all the Smiths stuff alone now - there was a time and a place, and his current stuff is far more pertinent today. Not my favourite song bit I suppose it's length and insistent nature lend themselves to the forlorn impatience of the lyrics. Info about stage times for Morrissey in Toronto from the venue!